When my husband was first saved, his old friends were not happy. They didn't like the change in him and wanted nothing to do with it. My husband knew it was time to move on. For nearly 19 years he went without a close male friend. He didn't seem bothered by it. After all, raising a young family with 4 kids, having a full time job and doing full time ministry work, we were plenty busy. There were men that came into our lives, husbands of my friends or some men in our church, but he never seemed to be able to create that connection with them. He enjoyed going out to lunch, with the wives and kids, and that kind of thing. But a real heart connection never happened. I never worried about his lack of a male friend. I knew he had me to talk to and share with. That's all he needs right? He had all of our siblings and parents. He was good to go, in my mind. About 2 years ago, God spurred my heart to pray for my husband to have a good, Godly male friend. I have incredible, precious, Godly female friends who bless me more than words can say and God was showing me that my husband needed the same. I began to pray that God would bring a Godly man into my husband's life that would teach him and learn from him, pray for him and be prayed by him, encourage him and be encouraged by him, laugh with him, and live life with him. Boy did God answer my prayers! Before I tell you how He answered, let me tell you why He answered. and one person sharpens another. without another to lift him up. God didn't intend for us to do this life alone. He says in His Word how important it is for us to have friends. We need each other. Sometimes our husbands need to talk to someone for prayer, encouragement and advice. Someone other than us. Someone who sees that male perspective and understands in a way we won't. Sometimes they need someone to give them a little knock on the head and tell them they are acting like a knucklehead, something they will not accept from us. If your husband has Godly male friends, encourage him to cultivate those relationships. Pray that God would bless the friendships. If he doesn't have Godly male friends, immediately begin to pray that God would bring someone into his life. Praying that God would give your husband Godly friends and grow the relationships is a prayer that He will honor because it is straight from His Word. In addition to praying for your husband to have a Godly male friend, allow him to actually have this friend. Sometimes as wives, we don't want our husband to leave to go hang out with a friend. His free time is so little and we want to spend it with him. Yet, if he is not given this time to develop the friendship, it is not going to grow. When he says he's going to lunch or fishing or to play basketball or just needs to talk to his friend, don't get upset. Instead, give him your blessing and while he is with his friend, pray over the both of them. Pray that their time together would be fun, but would also be spiritually uplifting for the both of them. You can also invite his friend and his family over for dinner to grow a family connection. So how did God answer my prayers? He sent a family to our town and our church. Not only did my husband gain a strong Christian friend, but I gained an amazing new Godly friend and our kids gained new friends. His new friend speaks life into him, prays for him, encourages him, laughs with him and does life with him. They have become the best of friends, brothers really. We have been greatly blessed. In addition, other families have become good friends and friendships with men he already knew are being cultivated. When God answers, He answers! 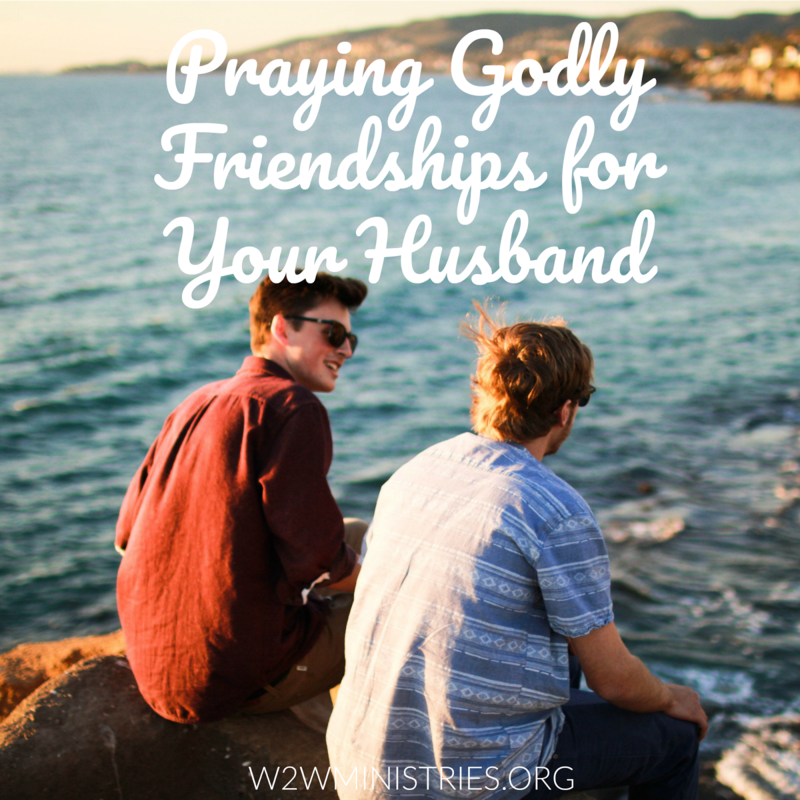 Does your husband have Godly male friends? If so, do you encourage the cultivation of these friendships? If not, how can you begin to pray for him? Share your experiences and thoughts.